As I wrote in this recent post, cratering oil prices, decelerating wage growth and heightened uncertainty beyond our borders are already sapping our economy’s momentum. Those factors, in addition to the lagged impact of the five quarter-point rate hikes the BoC has already implemented so far this cycle, are combining to dampen inflationary pressures. Will that be enough to stay the Bank’s hand? 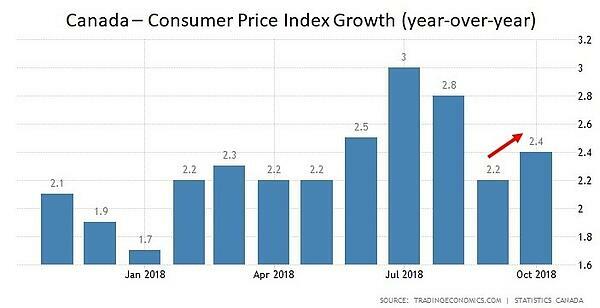 Our Consumer Price Index (CPI) increased by 2.4% on a year-over-year basis last month, up from 2.2% in September. This marked the first increase in overall CPI since it peaked at 3% in July. The increase in price pressures was broadly based. 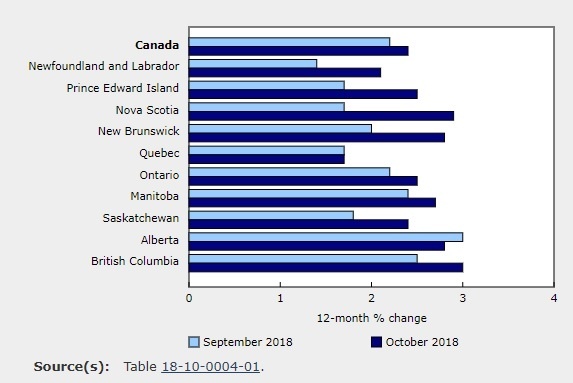 Prices rose in every province on a year-over-year basis last month, and the rate of increase accelerated in eight of the ten provinces. Our CPI rose by 0.3% on a month-over-month basis in October, which was more than the 0.1% increase the consensus had been expecting. 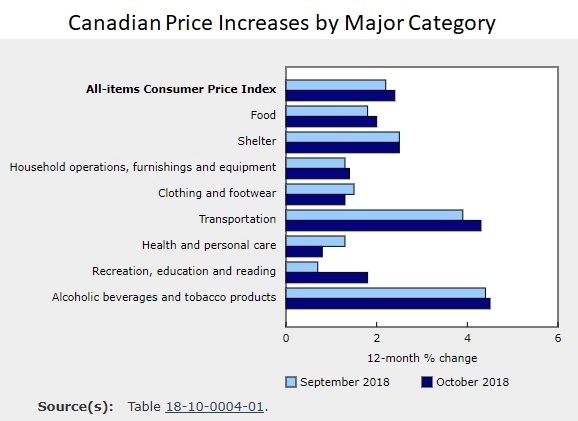 Prices were primarily led higher by rising costs for transportation (+4.3%), alcohol and tobacco (4.5%), and shelter (+2.5%) costs. 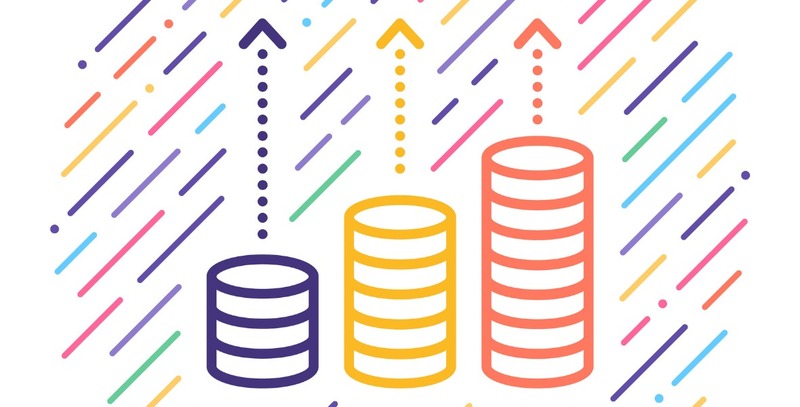 There were increases of approximately 1% to 2% in all of the other major price categories as well. In summary, prices rose broadly across our economy last month, and overall inflation increased in October after decelerating over the prior three months. That said, inflationary pressures are expected to slow in November in response to sharply lower gas prices, which means that our current inflationary uptick is likely to be temporary. As such, my guess is that the BoC will look through the October data when determining the appropriate monetary-policy path forward. The Bottom Line: In its most recent policy statement, the BoC said that it expects that it will need to continue raising rates in order keep inflation near to its 2% target. While I don’t think our October inflation data are likely to impact the Bank’s rate-hike timing, I do think that the combination of factors I outlined above will slow its plans over the near term. If I’m right, our fixed and variable mortgage rates will hover in their current ranges into the new year.